In typical interview fashion, would you be so kind as to introduce yourself to our reviewers? Keisuke Kikuchi: I’m Keisuke Kikuchi. After having been the producer of Deception, the “trap game” series, as well as Fatal Frame, the horror game series, I was put in charge of the Nights of Azure series. We’re glad that many fans played the first title, and are excited to be able to develop a sequel for them! Thank you, and now with the introduction out of the way, we can properly commence with the interview. Miketendo64: For anyone unfamiliar with the Nights of Azure games, what are they? How do they play and how do they compare to other games available in today’s market? Keisuke Kikuchi: This title features the main character fighting together with heroines called Lilies and monsters called Servans. Lilies and Servans each have unique ways to fight and special abilities, so the gameplay changes depending on the parties the player forms, creating a high degree of freedom for how they want to play the game. Miketendo64: Besides localization, are there any other reasons as to why the Western release of Nights of Azure 2 is in October, when the Japanese version released in September? Keisuke Kikuchi: No, the only reason for the difference in the release timing was localization. Miketendo64: Since things can vary in a game due to localization, is there anything in the Japanese version of the game that will happen and can be encountered, which doesn’t appear in the Western version? Keisuke Kikuchi: Everything, including character names, are the same for this title, we didn’t make any changes for this title’s localization. Miketendo64: How long has Nights of Azure 2 been in development and what has been your favourite thing about being involved with it? Keisuke Kikuchi: We’re keen to support Nights of Azure 2 after launch, and will be offering several additional DLCs such as stories and adventures post-launch. Miketendo64: Besides the extra content we’ve learned about already, are there any plans to continue to support Nights of Azure 2 even more so post-release? Keisuke Kikuchi: We’ve been developing the game for about a year. Miketendo64: Given the fact developing a game is always a learning curve, was there anything you and the team learned from working on the first Nights of Azure game, which game in handy for working on the second one? Keisuke Kikuchi: We handled various issues that the previous title had concerning getting players immersed in the story’s events. For the scenarios, I once again teamed up with Makoto Shibata, as we had worked together on the scenarios for the Fatal Frame series. We strived to make sure the story would unfold in a way that was exciting for players. Miketendo64: If you could only pick one thing about Nights of Azure series that is your favourite quality to it, what would you pick? Keisuke Kikuchi: If I had to choose just one it would be the character designs of Yoshiku, our illustrator for the game. It was my task to reproduce the character designs, give the girls active roles to play, and create a world in which they could stand up and meet their fates. Miketendo64: Although Nights of Azure is not exclusively being developed for Nintendo Switch, was it ever considered to give the Switch version amiibo support that could either incorporate Nintendo amiibo that are already made like Skyrim with The Legend of Zelda: Breath of the Wild amiibo, or even a special Nights of Azure 2 amiibo? Keisuke Kikuchi: We hadn’t considered implementing amiibo for this title, but I personally own some amiibo myself, so it might have been nice if we had considered trying to do something. Having certain Servans appear depending on your amiibo would be interesting. Miketendo64: Given the fact Nights of Azure had 5 Endings in total, how many does Nights of Azure 2 have and is there a New Game+? Keisuke Kikuchi: There are multiple endings, but as for exactly how many, that’s something we’d like players to discover for themselves. New stages will be available as additional DLC. Miketendo64: Being as though Nights of Azure 2 is a sequel, was it something you had in mind when developing the first game, or is it just something that happened afterwards? Keisuke Kikuchi: The director of the first title had some ideas in mind for a sequel, but I didn’t have any particularly strong ideas. It was only after releasing the first game and receiving users’ feedback that our ideas started taking shape for how we wanted to proceed with the second title. It was around the same time that we were localizing the first title that we started finalizing our plans for a sequel. Miketendo64: While it might be too soon to say, are there any plans to expand on the Nights of Azure franchise, such as a third instalment, or even a spin-off game like Azure Warriors? Keisuke Kikuchi: I personally have ideas I would like to implement if there were to be a third title. Heroines cooperating with each other and fighting together with Servans are characteristics of the series, and I have several ideas about the people, or even things I would like to see fighting together with them, as well as how they would fight. Many heroines have made their appearances in the first two titles, and I’ve grown attached to them, so I’d like to see them play even more active roles. Miketendo64: While Nights of Azure was lucky enough to get a sequel, which is soon to release, are there any games out there that you feel deserves a continuation or a sequel like a Bayonetta 3? Keisuke Kikuchi: There are many. For example, there was a PlayStation game called “Jumping Flash!” that would probably be fun to play using current VR technology. I’d also like to play sequels of Survival Kids, Dino Crisis, and 428. Miketendo64: With the Nintendo Switch being the first platform a Nights of Azure title was made for, what promoted the decision to bring it to a Nintendo platform in the first place and how have you found developing for Switch in comparison to PS4 and Microsoft Windows? Keisuke Kikuchi: Whilst this is the second entry into the series, its story is independent, so we decided to create the Switch version to allow even more users to play the game. We applied our company’s software development library to develop the Switch version, which allowed us to easily port the basic portions of the game. However, because the Switch has stationary and portable modes, which is what makes the hardware so fascinating, we had to be careful about how we fine-tuned the game for all the modes. 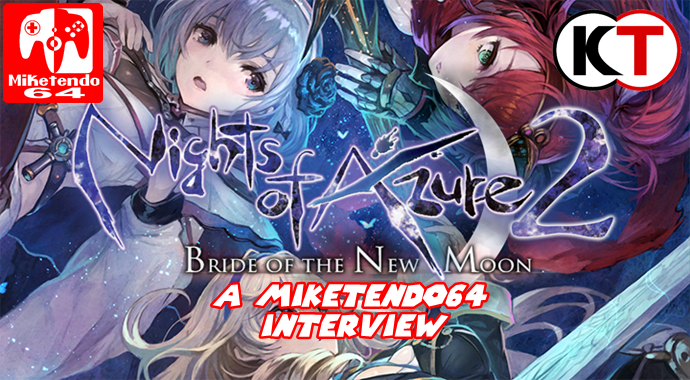 Miketendo64: Depending on the level of success the Switch version of Nights of Azure 2 is met with, would you be open to the idea of porting Nights of Azure 1 to Nintendo Switch as well? Keisuke Kikuchi: Yes, I would be happy to if there was a high demand for it. Miketendo64: On the subject of porting games to Nintendo Switch, if you could see any of your previous games brought over to Nintendo’s newest platforms, what games would you like to see make the transition and is there anything you would like to see done to them, to encompass the Switch’s spectacular features? Keisuke Kikuchi: It would be interesting if we could use the Switch console itself as a camera for the Fatal Frame series. Miketendo64: As a developer of video games, what/who was it that inspired you to get involved in the video game industry and what is it you would say that drives you to create the games that you do? Keisuke Kikuchi: I got inspired when I was a child while watching my parents use their personal and pocket computers and trying them out for myself. I was more interested in creating rules and worlds than in playing games. After creating each game, there were things I couldn’t complete and things I wanted to do for the next game, and those things became my motivation for developing the next project. Miketendo64: While I may not make games myself, I am a published author, so I’m no stranger to having a bizarre through process. So on that note, what would you say is your thought process when it comes to working on games and did you do anything differently with Nights of Azure 2? Miketendo64: If you were given the chance to work on any game you wanted, for a franchise you greatly admire, like Disgaea or The Legend of Zelda, what franchise/game would you pick and what would you do differently with it? Keisuke Kikuchi: Recently I’ve been really into playing Fire Emblem Warriors, one of our company’s titles. I’ve played every game in the Fire Emblem series, so I’ve grown attached to the characters, and it is fun to see them in action in an SRPG setting. Keisuke Kikuchi: I’d pick the Super Robot Wars series and expand on the Cover Attack aspect. It would be fun if, when a robot on the map attacked, a character could chain together a combo attack with the robot to change the position of an enemy, or if you could capture an enemy and make them your ally. Miketendo64: And because there’s always time for one last question, here’s ours: Is there anything you would like to say to your ever growing fanbase and supporters? Keisuke Kikuchi: Thank you for continuing to play our games. Starting with the Lily “Heroine System” and Servans changing into weapons, Nights of Azure 2 is packed will all kinds of ideas, so I hope you will enjoy the game. What I really like about my work is seeing the feedback online from fans who have enjoyed the game! Thanks to everyone for your feedback, and we hope we can apply them to the next title or perhaps a different game. We would just like to take this moment to personally thank Keisuke Kikuchi, for taking the time to answer our questions and Nathan Mills of Koei Tecmo UK for arranging the interview in the first place. We greatly enjoyed both Fire Emblem Warriors and Nights of Azure 2: Bride of the New Moon, and we greatly look forward to the next game Koei Tecmo brings to the Nintendo Switch.